The 2019 AWP Conference Bookfair opens tomorrow! Stop by booth 8066 and say hello, browse our books, and learn more about The Conium Review. 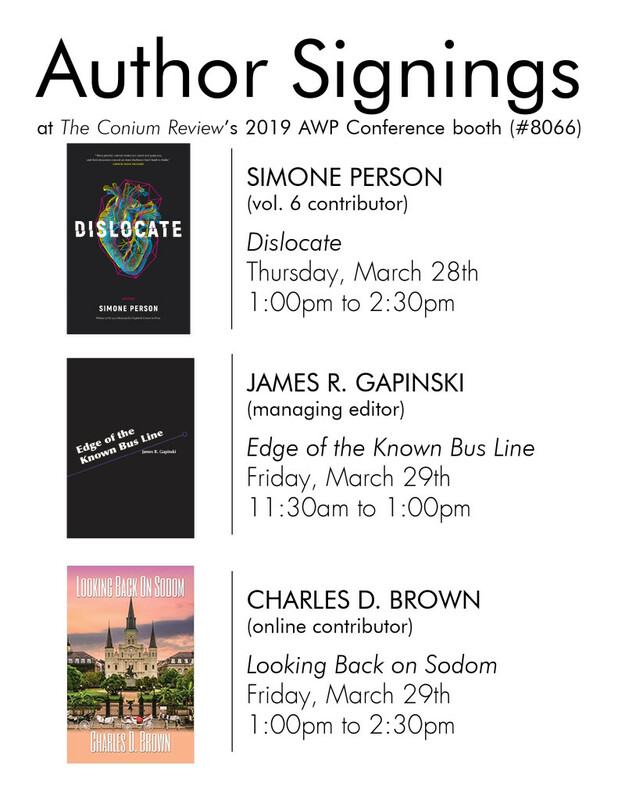 We’ll also be featuring three author signings this year, starting with Simone Person from 1:00pm to 2:30pm on Thursday, March 28th. Next, we have James R. Gapinski signing books from 11:30am to 1:00pm on Friday, March 29th. Finally, Charles D. Brown will be signing from 1:00pm to 2:30pm on Friday, March 29th. Simone Person is the author of Dislocate, the winner of the 2017 Honeysuckle Press Chapbook Contest in Prose, and Smoke Girl, the winner of the 2018 Diode Editions Chapbook Contest in Poetry. She grew up in small Michigan towns and Toledo, Ohio and is a dual MFA/MA student at Indiana University in Fiction and African American and African Diaspora Studies. In 2018, Simone became the Prose Editor for Honeysuckle Press. She sporadically, and to varying degrees of success, uses Twitter and Instagram at @princxporkchop. Charles D. Brown is a writer and filmmaker from New Orleans. He currently lives in Los Angeles, where he received his Master’s in Professional Writing from the University of Southern California. He has made two feature films: Angels Die Slowly and Never A Dull Moment: 20 Years of the Rebirth Brass Band. He has published two novels Vamp City (as C.D. Brown) and Looking Back On Sodom. His fiction has appeared in The Conium Review, Oddville Press, Writing Disorder, Jersey Devil Press, The Menacing Hedge, plus the anthologies Dimensional Abscesses and Nocturnal Natures. He teaches composition, journalism, and media production at a variety of colleges.